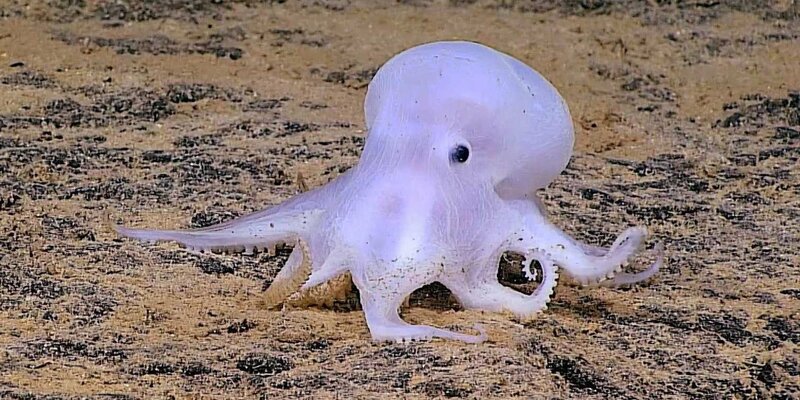 Sticking with the octopus theme this week - scientists have discovered a cute little octopod resembling Casper, the friendly ghost, in the deep sea near Hawaii. The animal, which is possibly a new species, was discovered by Deep Discoverer, a remotely operated vehicle, or ROV, more than 2 1/2 miles underwater. Cirrate octopods, which have fins between their arms and little finger-like strands near their suckers, have been reported at depths up to 5,000m. But the octopod encountered by Deep Discoverer was incirrate, like the familiar octopus - and incirrate octopods have never before been detected at depths below 4,000m. This animal was particularly unusual because it lacked the pigment cells, called chromatophores, typical of most cephalopods, and it did not seem very muscular, resulting in a ghostlike appearance, leading to a comment on social media that it should be called Casper, like the friendly cartoon ghost.